Is Tarn Hows Lake District's most popular tarn? Tarn Hows could definitely be the Lake District's most walked around tarn... it is very pretty, changing with every season and weather variation. This is a very easy 3km circular walk along a very obvious well-maintained track. Tarn Hows is ideal for those who want to enjoy the outdoors without going off the beaten track, the well-maintained pathway makes this walk ideal for families with toddlers or those who need wheelchair access. I'll let you into a secret......Tarn Hows has been discovered... this is not a 'Cumbrian secret' so if you want to avoid the crowds, why not plan an early morning walk.... or perhaps enjoy an evening walk here as the sun is setting. 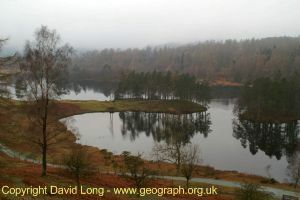 We invite you to watch this short YouTube video of the Tarn Hows walk. Easy access from both Coniston and Hawkshead and there is a National Trust car park at the start of the walk. From Coniston to Tarn Hows take the road B5285 out of the village towards Hawkshead and the north end of Coniston Water. Follow signs for Hawkshead and then Tarn Hows. From Hawkshead to Tarn Hows Take the B5285 towards Coniston then turn right following signs for Tarn Hows. Disabled Access - Tarn Hows has a dedicated National Trust Disabled access car park and The National Trust notice on the gate reads: This path is maintained for 260 metres, leading to a seat with views over the tarn and surrounding heathland (15 mins one way) The steepest section of this track is the first 50 metres with gradients up to 1:8 For access to the Tarn Hows circular route please park in the main car park.